They say that Kansas is so flat that you can see your dog run away for a week. This is only partially true, because in Northeastern Kansas where I grew up there are lots of hills, forests, lakes and rivers. Among the hills of that region, nestled back, far away from the sounds of the city, where only meadow larks and cicadas interrupt the deafening silence of the prairie, there lies a mostly unnoticed cemetery. In the corner of that cemetery, off towards the edge where the woods begin, is the grave of a friend of mine. It reads: “Adveniat Regnum Tuum!” “Declan Brown nLC 1981 – 1995” … Declan had been one of my good friends in grade school who knew from a young age that God was calling him to the priesthood. He had visited the Legionary Apostolic School in New Hampshire where fell in love with Christ and discovered his vocation: to be a Legionary priest and save souls, bringing them to heaven. The priesthood never dawned on me at the time. I was 15. The first time it ever occurred to me that Our Lord might be calling me to the priesthood was when I was 16, and at a youth mission in St Louis, Missouri. It was the end of May 1997. My older sister had just finished her first year of college at Notre Dame. She was raving about these door-to-door missions she had been on in South Bend, Indiana and said there would be another upcoming mission in St Louis that I simply “had to come to.” I told her I would never go on such a boring trip. I had planned to go to the movies with my friends that weekend. That’s when my mom chimed in and said “I was going to make sure my sister and her friends would be safe on the 5 hour drive (apparently at 6’ 210 lbs. I was considered the family bouncer). So off to the missions I was, and not looking forward to it. The first glitch was upon arrival: It was an all-girls mission! There must have been some mistake. That’s when Fr. Michael Goodyear, the chaplain for the girls’ mission came up to me and said, “You’ll have to come with me. I’ll show you the way to the guy’s mission.” Another 40 minutes into St Louis and we arrived at St Robert Belermine parish. That night we slept on the hard tile floor of the parish. I don’t think I slept much. I didn’t know of the other 30 guys on the mission. As I curled up into my sleeping bag I decided that for the next week I would just lay low, not get too involved, and let this whole “mission thing” blow over. First thing next morning we were at Mass celebrated Fr. Edward Hopkins LC, the chaplain for the guy’s mission. It seemed like a normal parish Mass until he began his homily by shouting at the top of his lungs into the microphone: “If you want to do anything for Christ, you have to come out of your comfort zone!” We were all shocked and looking around at each other thinking “Who is this priest and where did come from?” His words however, hit me right where I needed it. You see, I was bent on staying holed up in my shell, not willing to come out and actually do anything for Christ or for others. By the end of that Mass I had made a resolution to at least go out with one of the mission groups and accompany them. After mass we had Dunkin Donuts for breakfast. Then we each received our missionary T-shirts and a cross to where around our necks. In teams of three we were assigned geographic sections of a map showing the neighborhoods of St. Charles, Missouri, a sprawling suburb of St Louis, which was part of the parish territory. Off we went to begin knocking on peoples doors to ask if they had any intentions we could pray for, and to invite them to a rosary and Mass at the parish. I stayed back and let the other guys on my team do the knocking and asking, until I began to notice a pattern. The people we talked with seemed to have no idea about the importance of God in their lives. I had grown up in a family with a deep faith and conscious of God’s presence in our lives and of our final destination: Heaven. These people however, seemed to be living only for the present life, and with little concern for the well-being of their soul and the eternal life to come. That’s when I stepped in and began to knock on the doors myself. I wanted to engage these people and strike up a conversation that would make them think about the real priorities in life and the importance of the spiritual life. It wasn’t until after that conversation, when I entered the parish chapel, that the idea, deep down from within the heart, came into my mind: “Perhaps God could be calling me to the priesthood, to take up the path where my friend Declan had left off.” At that moment the emotion of such a profound call from God overwhelmed me. I spent about a half hour there reflection on what an immense good I could do for others as a priest. At the end of the week-long mission in St Louis, I joined Regnum Christi, incorporated by the founder, along with my sister, her friends, and some of the other guys that attended the mission. It wasn’t long though, after returning home, that the sound of God’s calling me to the priesthood was drowned out by the many other activities of the summer and of high school. Mountain biking, BMX, hunting, fishing, and fine tuning the engine and suspension on my car were some of the activities that I spent my time on. But most of my attention was focused on guitar, drums, bass and singing in a few different bands with my friends. In my junior year of high school I met Anna Shire. She had come from Linz, Austria where her family lived and where she had grown up, to study for a year at my high school. I asked her out on a date and we soon became best of friends. It seemed she understood me perfectly from the day we met. As a devout catholic girl she would attend the Holy Hour at the parish on Thursday evenings, so needless to say, I was there too, of course to pray (I usually fell asleep in the pew), but to afterwards spend some time with Anna. When the school year ended and she returned to Austria, I spent the whole summer working three jobs to earn some money to go visit her. She sent me a book at that time, which was about the Marian apparitions at Medjugorie. I had barely read a book before, but since she sent it I decided to read it. I also had to be prepared for the next phone call when she would obviously ask me about the book. That book really changed the way I thought about things, because the Blessed Mother said over and over again in her appearances to the visionaries “Pray, pray, pray for the conversion of sinners!” Page after page I was beginning to dawn on me how many people in the world were far away from God and wrapped up in a life of sin. I began to realize how important it was for me to pray. It was on one of my many long-distance phone calls with Anna that we both came to a similar conclusion about life: we needed to dedicate more time to prayer, but we had so much work and study to do. If we consecrated our lives completely to the Lord, then our main task in life would be prayer. The next morning was Thanksgiving day. After morning Mass and breakfast we all played football in the rain and snow until lunchtime. These guys were no nerds. When it came time to pray they took it seriously, like they were on a mission. In fact everything they did carried a sense of mission, from serving meals with a kind word and special attention to detail, to tearing it up on the football field. I quickly realized that the atmosphere of the seminary was deeply spiritual, fun and loving, yet no nonsense when it came time to getting things done in an orderly fashion. Not long after I returned home to Kansas. I was on my way to a blues show in Kansas City with my dad. The Grand Emporium, then a world renowned blues bar nightclub, was the venue. Son Seals a.k.a. “The Bad Axe of Chicago” was going to play that night. When we arrived at the ticket counter they said Son Seals was not going to perform. “Why not!” we asked. The door man replied sharply “because his wife shot him in the leg, ok.” I remember the ride home that night when my dad said “Son, I’ll support you in whatever you want to do in life, but are you sure you want to be playing in these kind of bars every night with your band for the rest of your life?” I thought long and hard about it over the next weeks. It seemed God was calling me to use the musical gifts he gave me, not for my own enjoyment, but for Him and for his Church. That’s when I joined the choir at the University of Kansas Catholic Campus Center. I began to learn to sing tenor in works by Handel, Bach, Di Lasso, Palestrina and Durufle. I also began to prepare an audition for piano and organ so as to study sacred choral and organ music at the University of Kansas. I learned an incredible amount from my teachers Marie Rubis Bauer and from Msgr. Vince Krische. Who were not only able to provide a wealth of knowledge, but a mentorship for me that I probably could not have found elsewhere. By the end of my senior year of high school I had auditioned and been accepted to the university’s organ program. All was in place to begin college in the fall. But something still remained. Was God in fact calling me to the priesthood, to give not just some musical talent, but my whole life to Him and His Church? I wasn’t 100% sure. Anna insisted that I find out and on one of those long-distance phone calls she said “I think you should go to the Legionary discernment program for the summer. Don’t write me, don’t call me, for the rest of the summer, until you know what God has in mind for you.” Fr Daniel Polzer, my spiritual director in Regnum Christi at the time, encouraged me to make sure everything was in place to go to college if it turned out that God was not calling me to the priesthood. I questioned him, “why don’t I just go to college first and then see about the priesthood later?” He replied “You could do that, but it might give the devil a chance to sidetrack you and distract you from what God may really want for you.” So that was it. After a week-long fishing trip up in northern Ontario, I was off to Cheshire, Connecticut for the rest of June, July and August to discern my mission in life. That was the greatest summer I ever had! The other forty or so young men on the course were all in the same situation as me. We were all interested in finding the path God had in mind for our lives. The tools were prayer, sacraments and spiritual direction, but also just bouncing ideas off each other in a great atmosphere of daily soccer games, ultimate frisbee and basketball and trips to the beach for cookouts. It was truly a great day, every day. But I was still unsure of whether or not God was really calling me to be a priest. I saw how amazing the family life would be, the good I could do as a husband and dad. But on the other hand, I recognized the immense good I could do as a priest, helping others as a spiritual father. I remember well, one day towards mid-August, we had a day-long spiritual retreat. At the end of the retreat I was there in the chapel in Cheshire. I said to our Lord “I just don’t know. I can’t decide. It’s up to you Lord. You have to tell me now what you want of me: If I should stay here and join the seminary or not.” It was at that moment that I lifted my eyes to the cross, to Christ crucified there, and felt deep down within Christ saying to me “I need your help.” It was in that moment that I made my decision. I would leave everything behind and dedicate my life totally to Christ. The next day we were on our way out the door to get on the bus and head to the beautiful mountains of New Hampshire for a week of hiking. Just before I left, the seminarian who was running the reception desk said, “Michael you have a phone call.” I couldn’t imagine who would be calling me, or who would even know the number. When I picked up the phone and said “Hello?” Anna replied “Happy birthday!” I had completely forgotten that it was my 19th birthday. Hardly before I could respond she asked “So, do you know what God’s will is for you?” I paused, and then answered “Yes. God wants me to stay and follow Him as a priest.” There was a long silence on the phone. I could tell it was hard for her to hear. Then she said “I’m happy for you.” I’m not sure what I would have done if she hadn’t said that. She was certainly much stronger than me in accepting my vocation, because it seemed God showered me with grace to respond to his call. Although it hasn’t always been easy to persevere in the priestly vocation, the difficulties and sacrifices you have to make in order to follow through on God’s call are well worth the effort if you can help those who are in spiritual need. It’s always apparent that setting aside your life completely for Christ, he makes of you an instrument of grace in the world. It’s a humbling, yet awe inspiring experience, to be a channel of God’s love to the souls he wants to touch through you. If this experience, simply as a seminarian and a deacon, has been tremendous of the past years. I can only imagine how truly awesome it will be as a priest, celebrating the sacraments of Our Lord’s own Body for the spiritual nourishment of souls in the Eucharist and pardoning sins with the Father’s own merciful forgiveness. 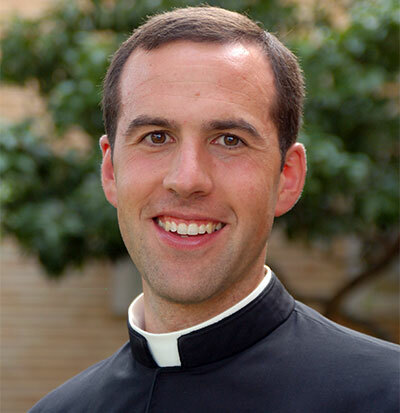 Fr Michael Moriarty, L.C., was born in Atlantic, Iowa on August 18, 1980 and grew up in the town of Lawrence, Kansas. In 1999 he graduated from Sancta Maria in Lawrence. He entered the Legionaries of Christ as a novice on September 15th of 1999 in Cheshire, Connecticut. After one year in Cheshire he went to Salamanca, Spain where he made his first profession of vows and studied classical humanities studies. He obtained a bachelor’s degree in philosophy at Our Lady of Thornwood in and spent three years of internship helping provide spiritual formation for businessmen in New York City. He then moved to Rome where he made his perpetual profession of vows and obtained a Licentiate degree in philosophy and a bachelor’s degree in theology from Regina Apostolorum Pontifical College.